Much like the excitement that Christmas is coming when I was little, knowing that my order for Banton Frameworks was one day going to show up has been tickling me pink for the last wee while. To bring you up to speed I found these guys through the amazing kickstarter campaign they were running to help them fully launch their incredible range of eye wear. You can read my introduction post to the team behind Banton here. Since the campaign was successfully funded it was down to me to actually make some decisions of which of the stunning frames on offer I was going to go for and man was that a hard choice. 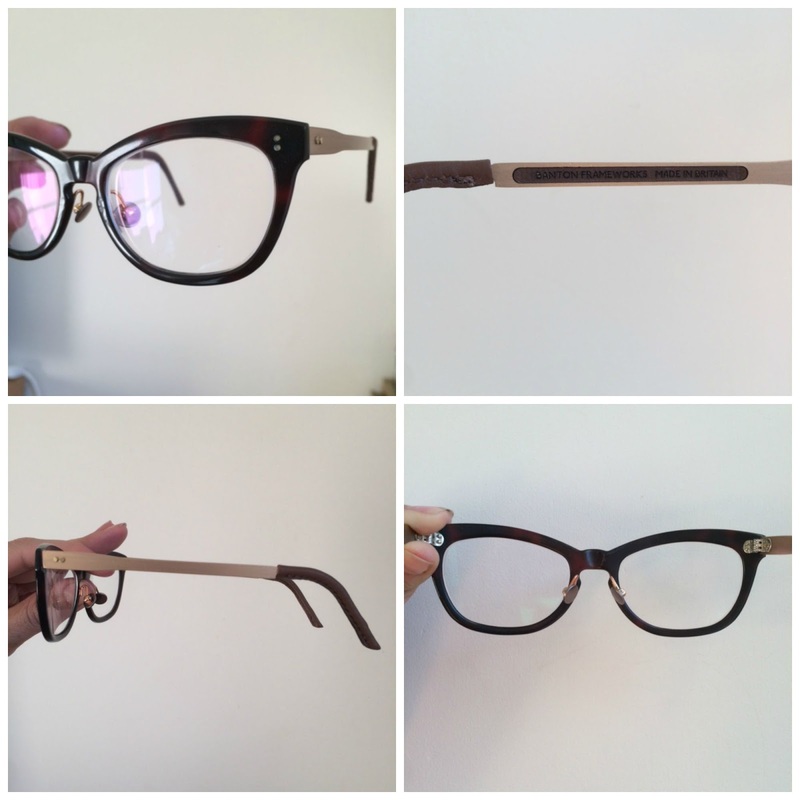 Starting at Frame Style ( adorably all named after British Inventors) I was totally stuck between the slightly cat eye shape of the Clancy and the more thinner and chic Lamont. Thanks to the incredibly well made App the team have created I could actually 'try' the frames on a picture of me and it really helped me make my decision. Clancy was the man for me. I was pleasantly surprised at how good the app was to use, I have tried various 'simulated try on' functions in the past with websites that have been generally been completely useless and not helped me make a good decision at all, but Banton have done theirs really well. Next up was my toughest decision was what my actual frame would be made from, I went back and forward over some of the gorgeous colours in the acetate and the quirkiness of the smoked oak but due to my paler colourings I decided the burgundy acetate was going to be a guaranteed winner and it went with the fittings that had really caught my eye. From here you can personalise your choices as far as your own temple fitting and leather colour for the legs which I love as they can really change the over all finished look of your pair. I thought the rose gold offering for the temple colour was really unique and that it complemented my frame colour perfectly and when I added in the tan leather on the legs the whole package had me really excited. Given the huge success of their kickstarter campaign I had to wait a wee while to receive my glasses but when all the individual elements are being carefully crafted and pieced together from all over the UK it really is no surprise! With the leather earpieces being cut and stitched in Somerset, the temples being created in Manchester and then all assembled with the frames back in their Lochside workshop here in Scotland, these specs really feel like a journey. I pretty much screamed when a package plonked on my desk out the blue and I realised inside was the stunning silver tin containing my Clancy's, and boy was it worth the wait. Elegant, beautifully crafted and impeccably stylish- these frames are a total prized piece. I love how they look on, I love the story they tell and I love how different and unique they are for me. The time the duo have taken in developing the processes they combine is evident in the quality of the finished products and they have been outstanding to communicate with throughout the process too. I am absolutely delighted with my frames, they feel insanely comfortable to wear ( I have clearly missed having a nosepad) and think it has been such a fun and unique experience that I wouldn't normally associate with picking glasses. I would definitely recommend checking out the bespoke option Banton are offering for your next pair or even consider giving the opportunity to create their own as a gift- I would love to receive something as special as this! You can check out the full range of frames here or download the app and try them all on. aw thank you cris! what a compliment!